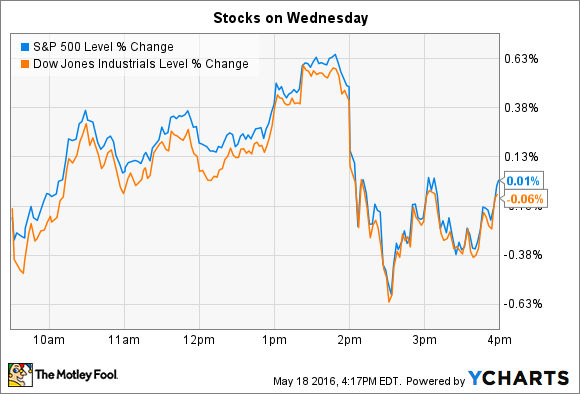 Why these two stocks badly trailed indexes on Wednesday. The Federal Reserve minutes released at 2 p.m. ET pointed to an interest rate increase next month, which helped push financial stocks higher. "Most" officials on the monetary policy committee see a June hike as appropriate, assuming economic data continues to imply steady growth, according to the report. Meanwhile, Wal-Mart Stores (NYSE: WMT) and Hormel Foods (NYSE: HRL) each made notable moves lower on Wednesday even as the broader market ran in place. Wal-Mart was the Dow's biggest loser, falling 3% after Target (NYSE: TGT) announced surprisingly weak Q1 results. Both retailing giants have enjoyed nearly two years of customer traffic gains, but Target's streak effectively ended this week – transactions rose by just 0.3% after a 1.3% rise in the prior quarter. Target's management also lowered its 2016 outlook and suggested traffic might shrink next quarter in the face of "an increasingly volatile consumer environment." Consensus estimates peg Wal-Mart's sales falling by 1% when the retailer posts its results on Thursday morning. Yet investors are bracing for a potentially weaker reading, along with a likely downward revision to the revenue outlook for the rest of the year. Wal-Mart might escape the worst of the retailing downdraft thanks to the major investments it's been making in its store design, and employee wages and training. That spending is pushing profits lower, but also keeping customers coming back. Shoppers are "increasingly pleased with the changes in our stores, and they're letting us and others know through improvements in the Net Promoter Score, and improved customer experience feedback," an executive told investors in a conference call in February. We'll find out soon whether those customer satisfaction gains were enough to keep traffic edging higher in Q1. Packaged foods specialist Hormel dropped 8% following a strong Q1 earnings report and an upgraded outlook for the full year. Sales ticked up by 1%, which met consensus estimates, and the 25% pop in earnings edged Wall Street forecasts that were looking for 18% growth. Sales volume fell 1%, but that still marked an improvement over the prior quarter's 3% drop. Net income surged 20% higher, thanks mainly to lower pork costs. Hormel sees that positive trend continuing into the final two quarters of its fiscal year, which is why management raised their earnings forecast to $1.58 per share from $1.53 per share. Its pork-heavy refrigerated foods and grocery products segments should lead the way in the back half of the year, "driving earnings increases through growth in value-added products combined with favorable input costs," Chief Operating Officer James Snee said. Hormel's stock fell despite that all-around solid report, likely because it had enjoyed such a strong rally recently. Shares were up 37% in the year leading up to this week's earnings report, and some investors simply took the news as an opportunity to cash in on a small part of those gains.